I'm not sure why I had such an intense affection for this dimly lit, insanely cluttered Polynesian-themed restaurant deep in the San Gabriel Valley, but I still feel heartache when I remember it's gone. It took forever to drive there and the food was terrible, but being inside Bahooka -- surrounded by carved tikis, nautical detritus, vintage gas pumps, street signs, travel posters, parts of an old post office and prison, plastic flamingos, and more than 100 bubbling fish tanks -- was like being on another planet. Where they served flaming drinks! 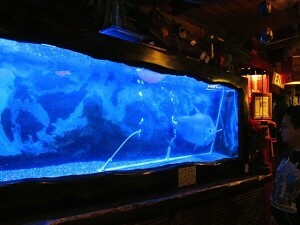 From a bar with fish swimming in it! Rufus, an enormous carrot-eating pacu, was the restaurant's official greeter for decades. Sigh. There will never be another Bahooka. This story aired on KCRW programs Good Food and Design & Architecture in 2013.